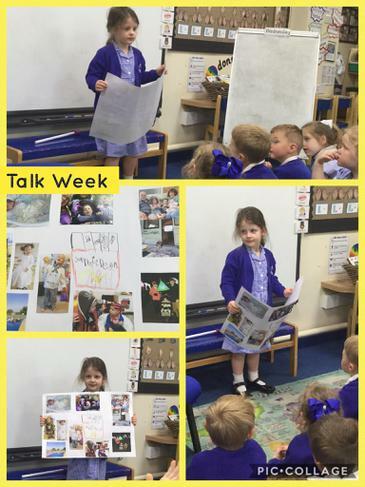 It was lovely to talk to the children and reflect on what they had enjoyed learning the most during their time in Reception. Their enjoyment of Maths was clear and we recorded some of their reflections. 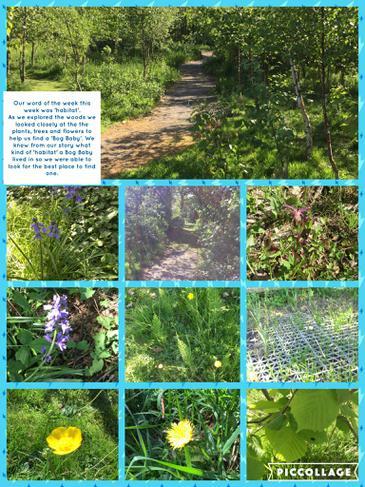 Inspired by the story ‘The Bog Baby’ by Jeanne Willis, we decided to go on a woodland walk to look for a Bog Baby. 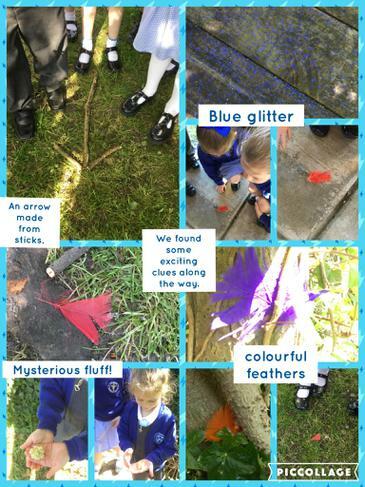 The children found a number of clues along the way and were excited to see bluebell flowers growing, just like in the story setting of Bluebell Wood. 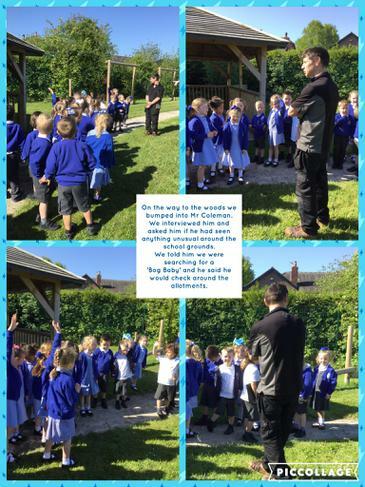 We met Mr. Coleman by the woods and the children interviewed him about things he may have seen in the woods. 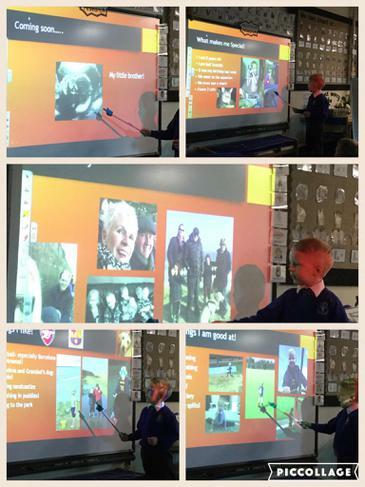 We were really impressed with some of the questions they asked him. 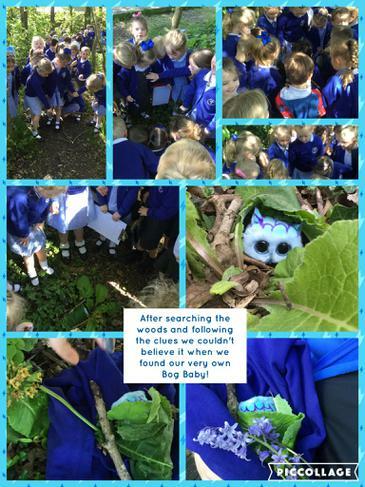 There was great excitement when we discovered a small Bog Baby hidden beneath a bed of leaves and branches. We carefully carried him back to our class and built a small habitat for him to live in. 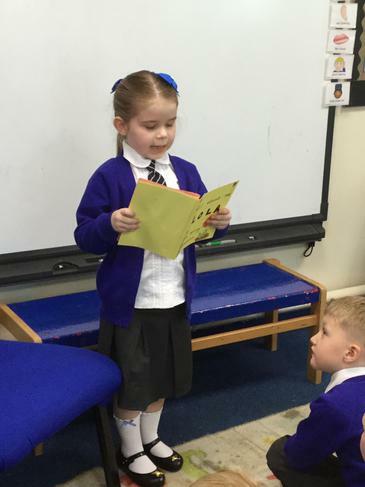 Isla suggested that we should ask Mr. Smith’s permission to have Bog Baby as a class pet, so we agreed we should all write letters to Mr. Smith to persuade him to agree. 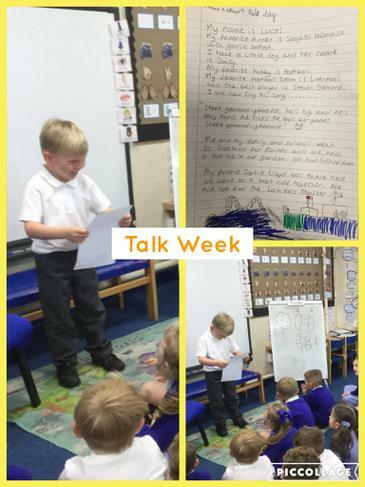 We were very impressed with how many children took up the writing challenge and remembered capital letters, fingers spaces, full stops and questions marks. We are keeping our fingers crossed that Mr. Smith will say “yes”! The children enjoyed working with clay and exploring the different ways of manipulating this natural material. They used their imaginations to create their own unique Bog Baby. Some children even gave their Bog Babies a name! 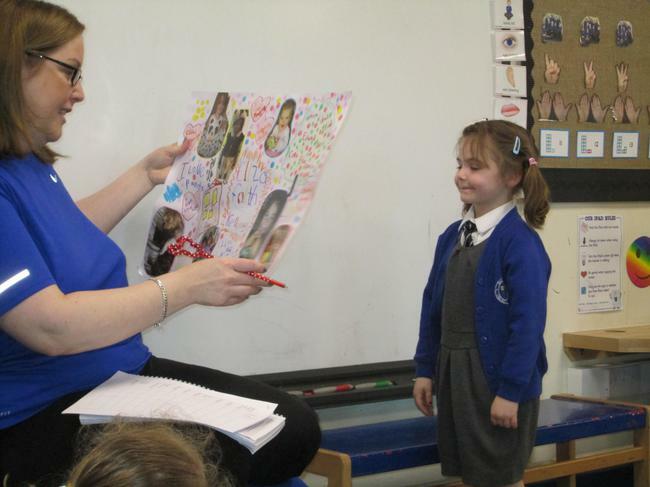 It has been wonderful to see the photographs, posters and writing that they have brought in to talk about. 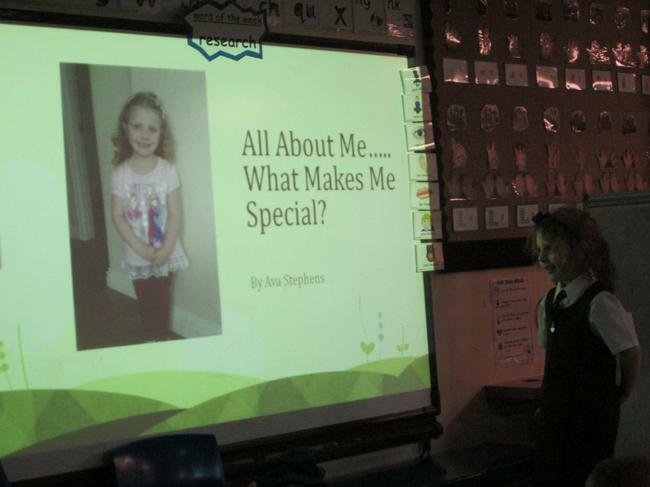 We have even had some ‘powerpoint’ presentations! 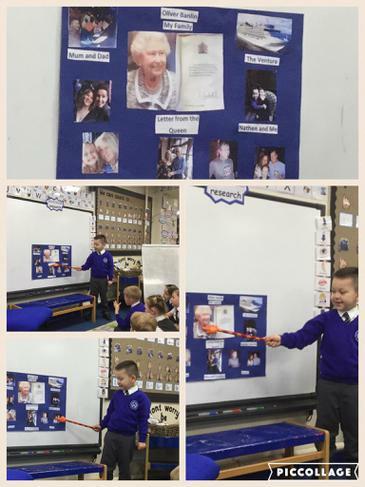 It was great to learn new things about our friends in class. It was also fantastic to see how much they have grown in confidence. We had a wonderful time at the Easter Bonnet Parade. 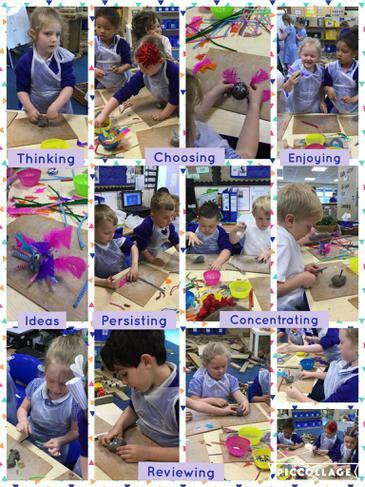 Everyone worked hard at home to design their own Easter bonnet. We were amazed at the imaginative ideas and fantastic creations! We all enjoyed singing our Easter songs in front of our family and friends. 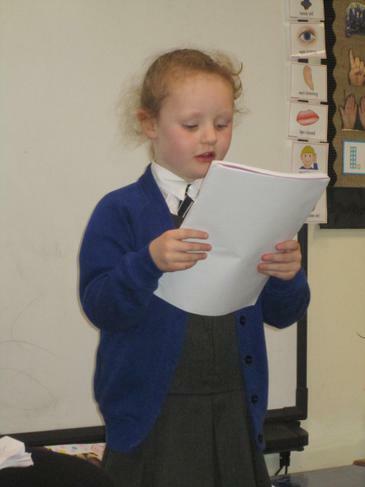 We were especially proud of the children who spoke confidently on stage to explain the real meaning of Easter. 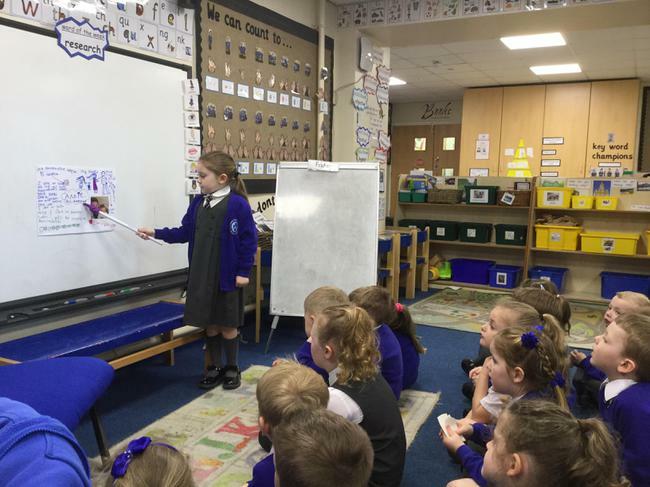 This term we have been learning about the Easter Story. 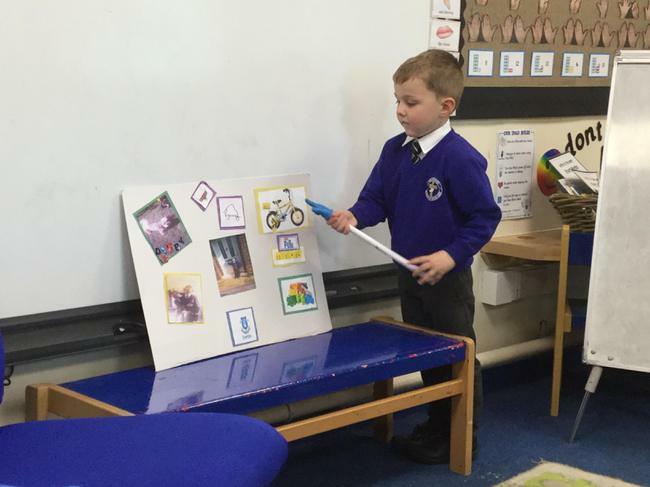 The children became Easter detectives as they explored all of the items in our Chatterbox and tried to make sense of the clues. 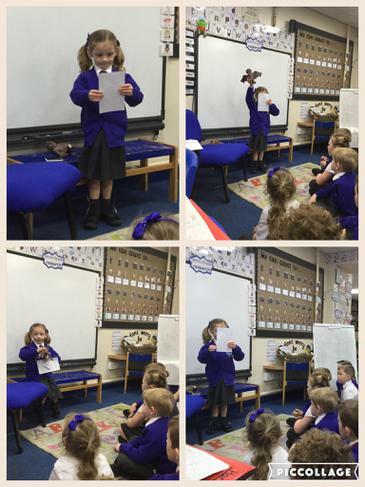 We shared stories about the events of Holy Week and now recognise symbols associated with Easter. We talked about the changing emotions in the Easter story and matched our feelings to emojis. We recreated our own ‘Last Supper’ and shared bread and prune juice. 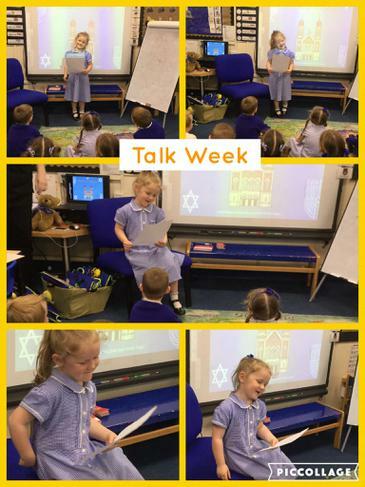 We took this time to reflect on events and Samuel and Isla shared their own prayers with the class. We recognised that Jesus died for us because he loves us and we celebrated when Jesus rose again on Easter morning by singing the song “Let’s Celebrate”. We all have great fun when we are doing ‘Marvellous Maths’. There have been so many challenging activities this term and lots of opportunities for the children to practice their maths skills during COOL Time. We particularly enjoyed helping Mrs. Dunn to make fruit salad for her dinner party, then solving her problem when she received a phone call to say that double the amount of people were coming! Luckily we had enough fruit to double the amounts on the recipe. We also had great fun in the outdoor classroom with Mrs. Morris’ bowling challenge. We did super counting and added up all of our scores to see who had the most points. We have now learned to count up to twenty in two’s and up to one hundred in tens. We have learned to do this by using our class counting abacus, our magic maths stick and singing some fantastic number songs. We were very lucky that Mr. Coleman built us an amazing new Learning Lodge. 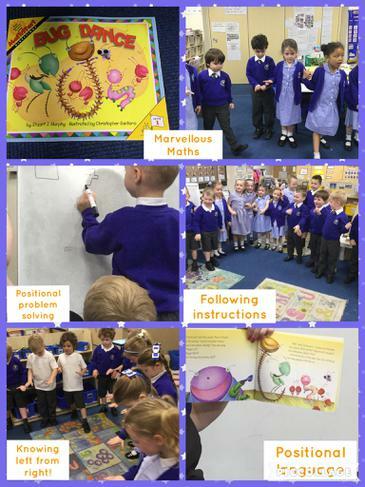 The children have certainly enjoyed accessing the resources to continue their learning independently. 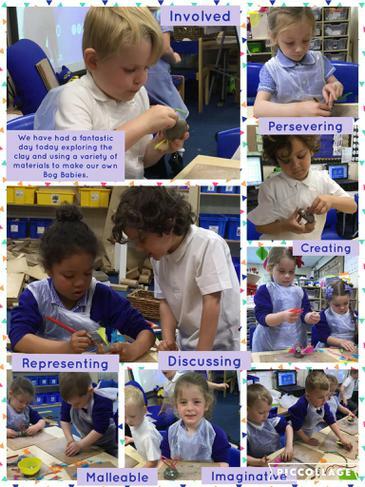 There have been a lot of opportunities this term for children to develop their gross and fine motor skills. 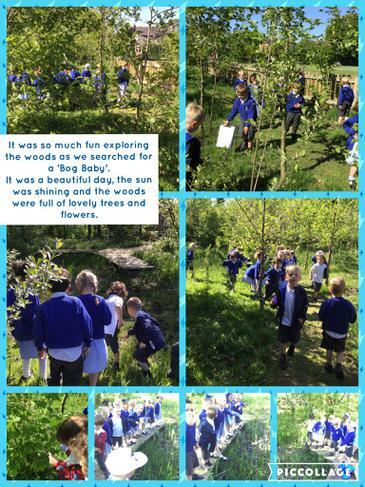 They have also had great fun using their phonics and writing skills in the outdoor classroom. 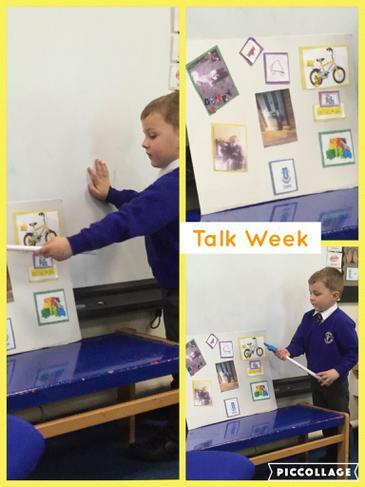 We have been exploring the different ways we can use technology to help us. 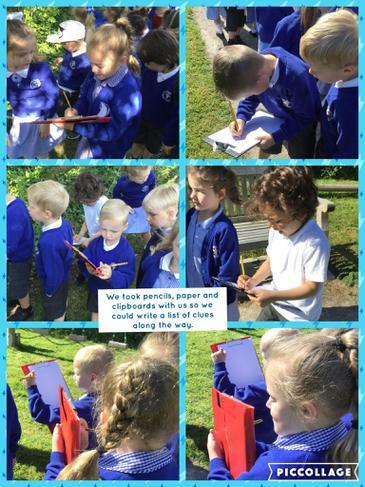 The children have been using the class ipads to play educational games, record each other, research information and to take photographs. 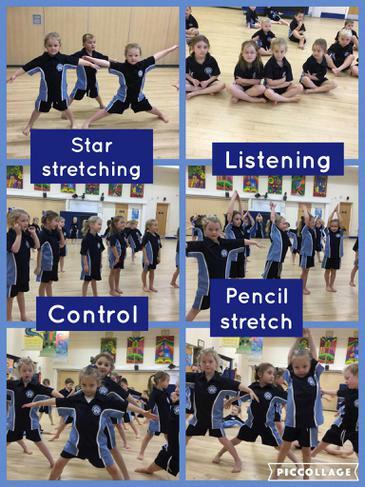 They found it particularly useful to access the slo-mo function on the ipad camera to evaluate their technique for scoring goals in the outdoor classroom. 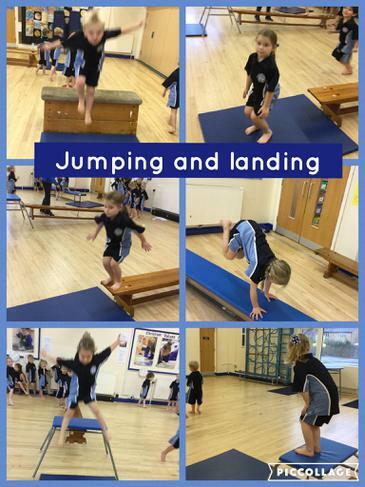 Reception have really enjoyed their P.E. lessons. 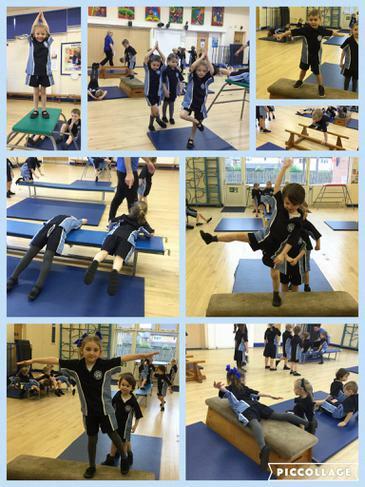 We have developed our gymnastic skills and learned to travel and balance on the equipment. 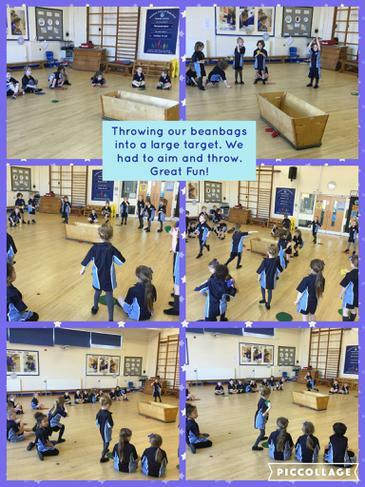 We have also developed our catching and throwing skills. 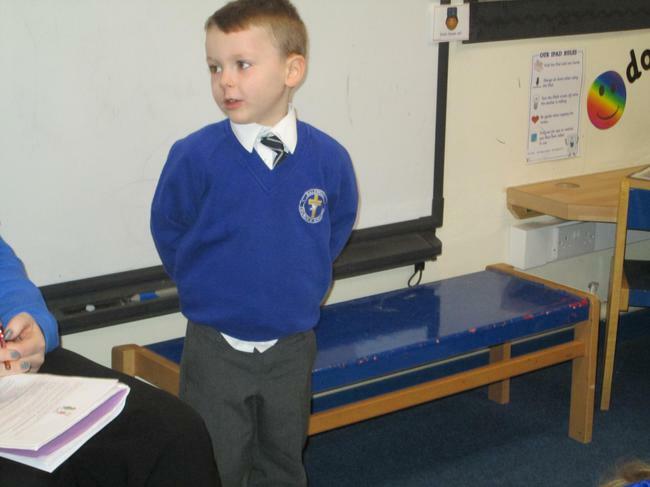 We have been really impressed with how quickly so many of the class can get themselves dressed independently. Some children have shown great perseverance in mastering the tricky buttons on their shirts! We enjoyed celebrating World Book Day on Thursday, 2nd March, 2017, and dressing up as our favourite book characters. 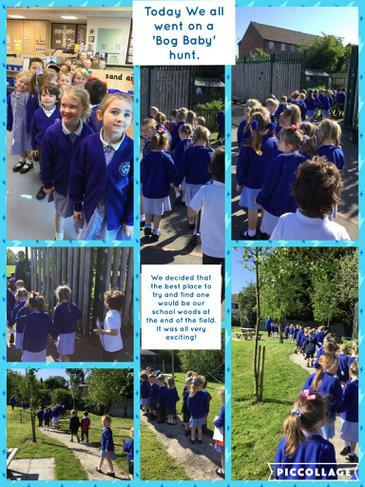 We worked together with the Nursery children to write a story and we all had great ideas for the beginning, middle and end. We later attended a celebration assembly with the whole school and enjoyed parading in our costumes. 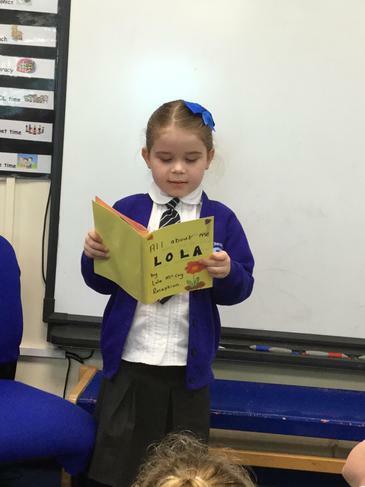 We were proud to hear our story read out and enjoyed listening to the stories written by Key Stage 1+2. 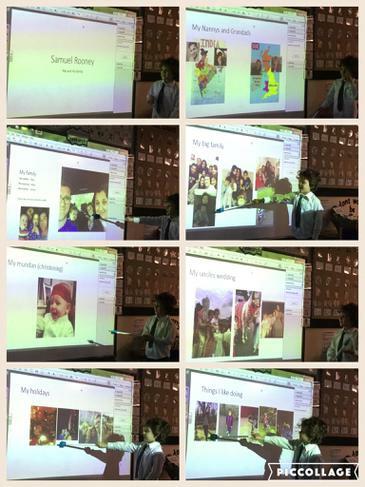 This year we learned about Buddhism. We talked about the history of Buddhism and shared the story of Siddhartha. 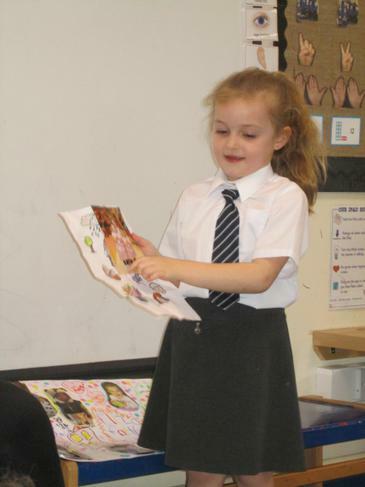 We also welcomed a special visitor to our school, who told us all about being a Buddhist. The children enjoyed practicing meditation, which is meant to develop awareness, kindness and wisdom. Mrs. Morris and Mrs. Dunn enjoyed the peace and quiet! We had a fantastic time in Foundation Stage learning about and celebrating Chinese New Year. 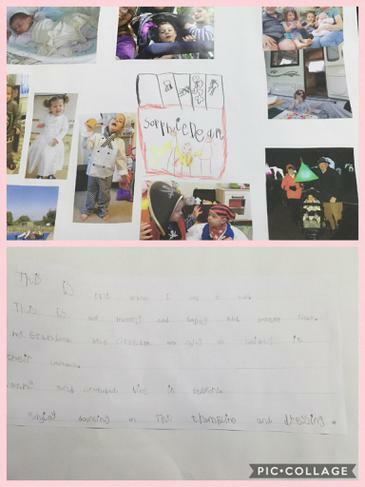 The children showed great enthusiasm for discovering new facts and exploring Chinese traditions. We learned about the Emperor’s animal race and that this year is the year of the rooster. The children enjoyed organising their own race outside, using the animal masks. The masks were numbered on the back to test the children’s counting skills and ability to recognise numbers. 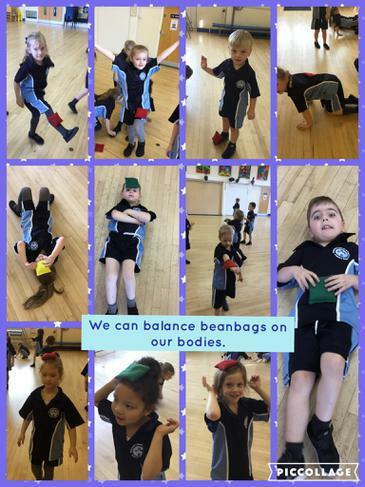 Many enjoyed this problem solving challenge and were keen to place the masks back into the correct order. We set up an inter-active display of Chinese dragons, pictures, decorations and musical instruments which the children enjoyed exploring. The challenge in the Reception workshop was to make your own paper lantern and decorate it with a repeating pattern. 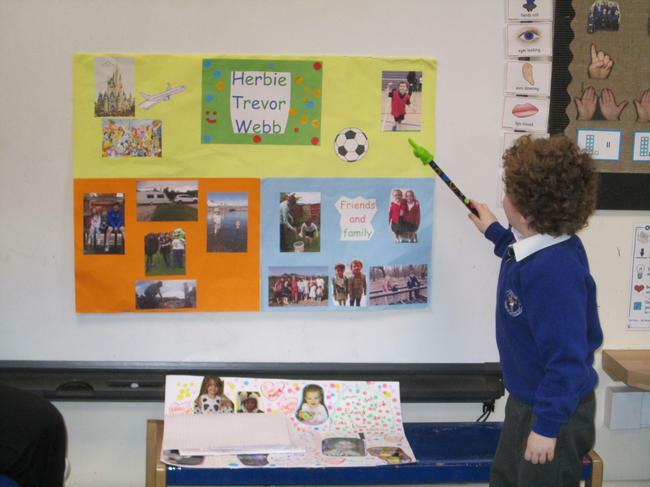 The class were quick to engage in this activity and created some fantastic patterns which they were able to describe. As the week progressed the lanterns became more complex and the repeating patterns more detailed. It was wonderful to watch the children growing in confidence and experimenting with new techniques in the workshop. Some children had their own ideas in the workshop and created magnificent dragons using a collection of cardboard boxes and materials. They also made an array of attractive paper fans decorated in bright colours. 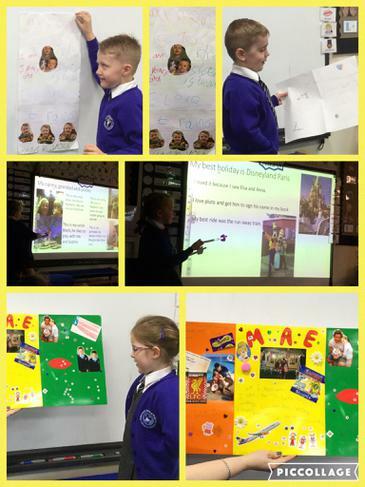 Whilst the children were proud to show off their excellent work to the rest of the class, they were more eager to take their work home to share with their families. The levels of motivation and enthusiasm within the setting were at times almost tangible. 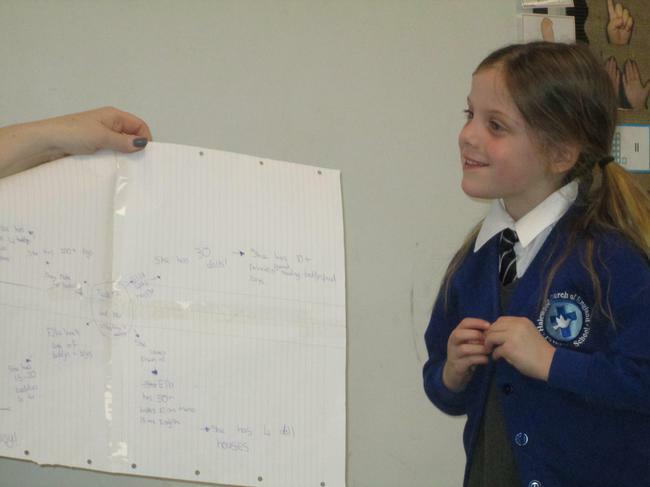 The children in Reception created a Mind Map and recorded in black what they already knew about Chinese New Year. 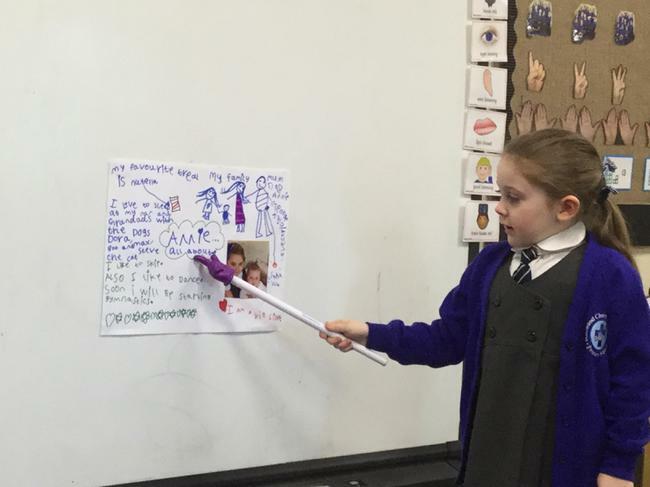 As they learned more interesting facts they added to their Mind Map each day, using a different colour pen. Ella brought in a calendar, made of wooden strips sewn together, from a local Chinese restaurant. We looked at fiction and non-fiction books to learn about Chinese New Year. 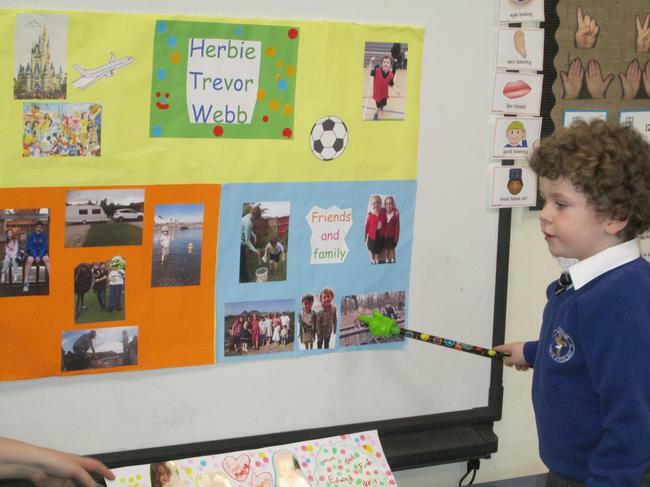 The children were keen to learn about another culture and fascinated by some of the facts we discovered. We learned that it is tradition for households to thoroughly cleanse the house to sweep away ill fortune and make way for good luck before decorating them. We therefore decided to decorate our classroom and hung brightly coloured paper lanterns and dragons from the ceiling. We changed our fruit and vegetable shop into a Chinese take-away. The children were highly engaged playing the role of shop keeper; allowing customers to choose food from the menu and telling them how much it would cost. The shoppers used real money and we observed some great problem solving as they used their maths skills to calculate total prices and the amount of change owed to the customer. The only problem with the take-away was that it made us all feel very hungry! 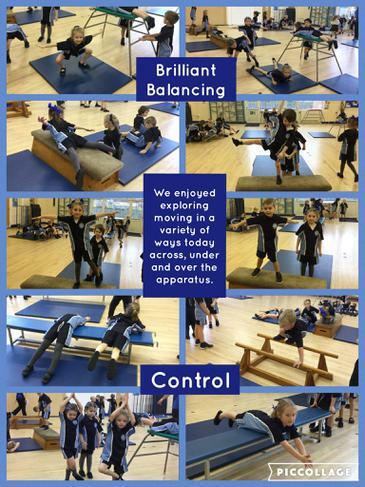 We carefully planned lots of challenges within the Continuous Provision, differentiated to appeal to all abilities, to develop children’s skills and extend their learning. A ‘chopstick challenge’ was set up to develop fine motor skills. The task was to fill up a bowl with noodles, by picking up one at a time, using chopsticks. We used white wool as noodles and the pieces were of different lengths and thicknesses. 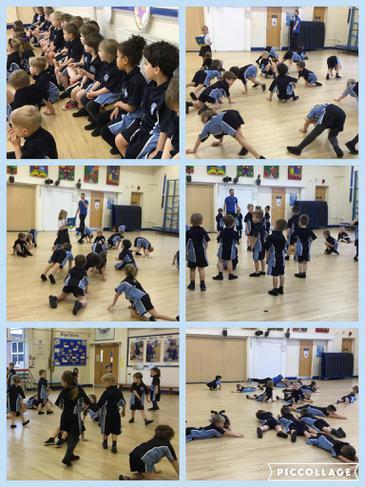 This was a difficult challenge but the children showed great perseverance as they focused on achieving their goal. It is a Chinese tradition to send New Year cards to friends and family and make lucky pictures. 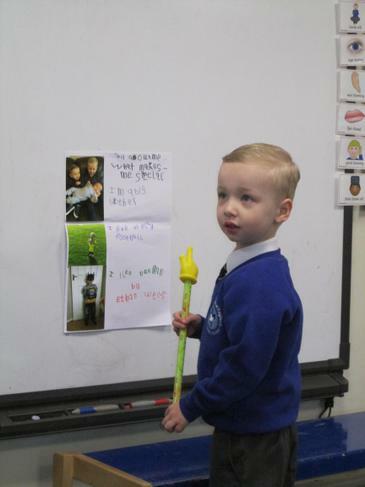 The children were keen to follow this tradition and were curious about using the special gold pens. Every seat in the mark making area was taken as children rushed to take part in this activity. 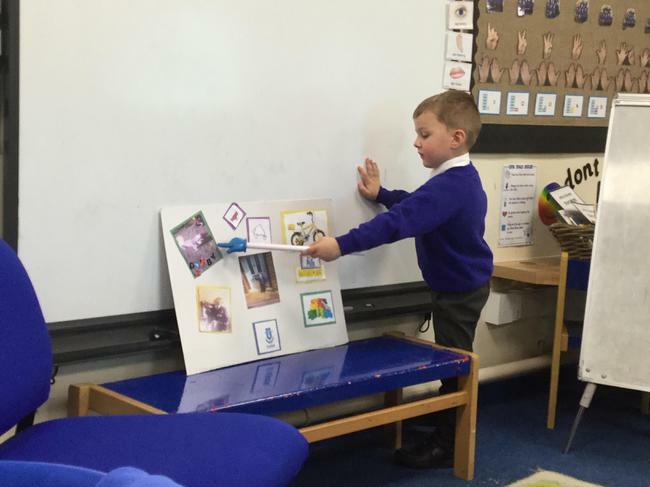 The children were unusually quiet - evidencing their concentration and focus on creating their cards and pictures. To mark the holiday, Chinese families typically unite and gather at each other’s homes to celebrate and eat together. We decided to have our own celebration at the end of the week. The teachers prepared a traditional Chinese buffet and the children tucked into rice, spring rolls, prawn cracker, curry sauce, sweet & sour sauce and noodles. The tasty food proved very popular with many coming back for second helpings! In keeping with our topic of ‘Healthy Living’ we finished off our buffet with slices of orange and Chinese pears. We all had great fun getting beneath the Chinese lion and dancing. It reminded us all of the film we watched of the dancing dragon parading along the streets in London during New Year celebrations. As we left school after a day of fun, we each received a lucky red envelope containing white rabbit sweets and lucky pennies. We also took home a fortune cookie- excited to read the message inside! 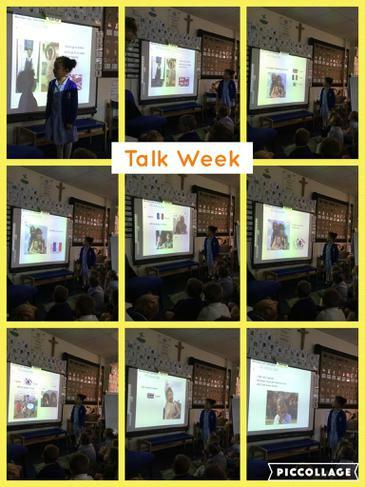 A wonderful week has been had by all learning about another culture. Lots of families have planned to continue this learning by going into China Town on Sunday to watch the New Year Procession in Liverpool and experience the excitement of dragon dancing and firecrackers in the street. We look forward to sharing your experiences. During Talk Week in school we invited Reception children to learn a joke at home. 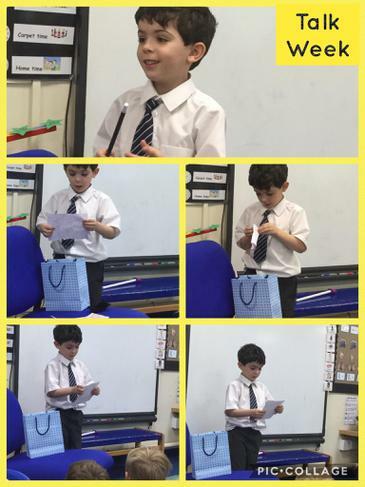 We then enjoyed a ‘funny hour’ where everyone was given the opportunity to stand at the front of the class and tell a joke. 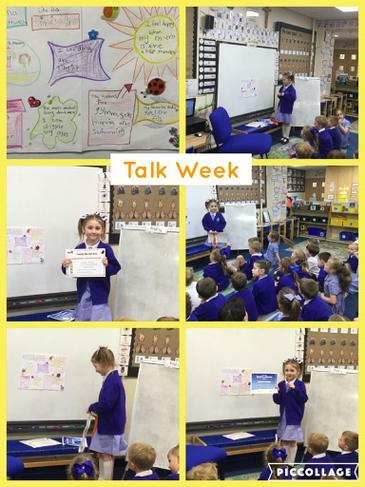 This was a wonderful opportunity for children to develop their confidence and practise their speaking and listening skills. 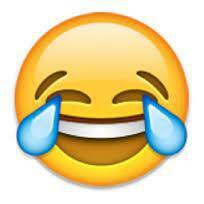 We had a great time listening to their jokes and our laughter could be heard throughout the school! Q: Where does the spaghetti go to dance? Q: Why did the banana go to the doctors? Q: What wobbles in the sky? Q: What is a crocodile’s favourite game? Q: Why can’t Elsa hold a balloon? Q: What do you get if you cross Father Christmas and a duck? Q: What do you call a dog that sits by the fire? Q: Where does a cow go on his holidays? Q: What do you get if you cross a snowman with a dog? Q: Why did the pie cross the road? A: No- cows go moo silly! Q: What is a pirate’s favourite shop? This year we created our own Christmas Nativity. 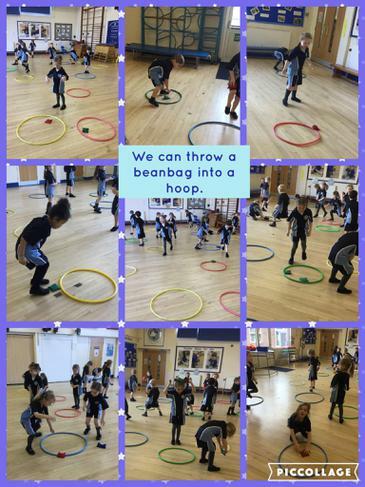 The children had really enjoyed reading We’re Going on a Bear Hunt by Michael Rosen so we decided to use that story as our inspiration. The children knew the Nativity story as we had shared it in R.E. so the children were able to suggest different people and animals that we could meet on the journey to find baby Jesus. 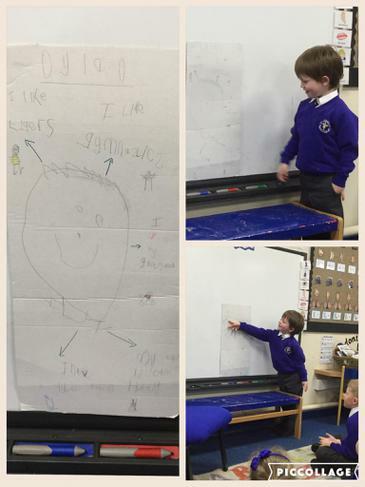 They had wonderful ideas and enjoyed contributing to our play. They worked hard to learn the song and actions and on the day they all sang brilliantly. 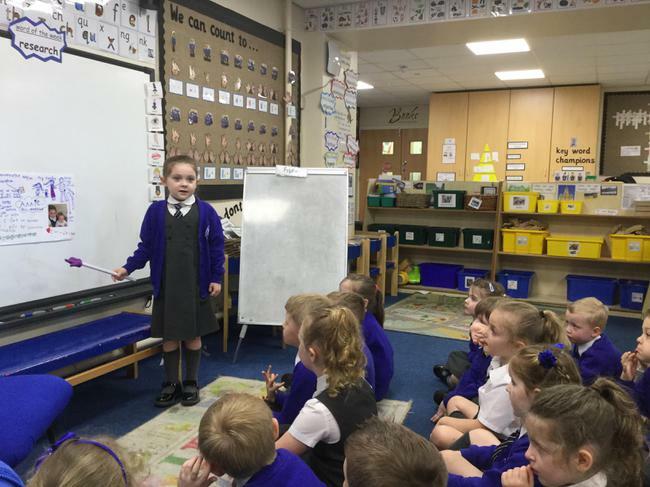 They particularly enjoyed singing the snowflake song and using their figures to show off their subtraction skills each time a snowflake blew away. The children looked wonderful in their costumes and we were very proud of how well they all performed on the day. They spoke confidently, remembered their lines and all joined in with the repeating verse. In class we remembered all of the brave soldiers who fought in World Wars. We talked about the uniforms that the soldiers wore and how difficult it was fighting in the trenches, often going without sleep and food. We also thought about the doctors and nurses who cared for the injured soldiers and helped to make them better. After the lesson, the children worked together to make a big poppy by drawing and cutting around their hands. During COOL Time the children used the resources in the workshop to make their own poppies. They showed great concentration as they worked together, talking about their creations. They used a variety of tools and materials competently to create their poppies and were quite rightly proud of what they achieved. 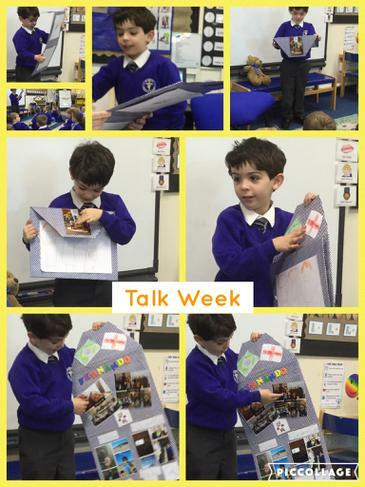 After watching a short film about Firework Safety the children were keen to talk about their experiences of watching fireworks with their families. They eagerly anticipated their weekend plans and recorded their experiences/ideas using black paper and oil pastels. The children talked about their fantastic firework pictures full of excitement and had remembered a lot of the Firework Safety Code. 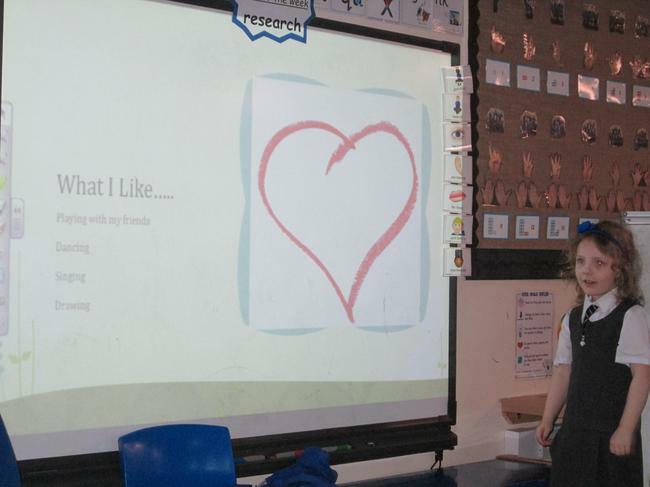 It was lovely to see them being so creative and involved exploring a range of media. Some great vocabulary was used to describe the fireworks and the sounds they made. Mr. Coleman has worked extremely hard building us an amazing Learning Lodge. We were all very excited to use this new space in our outdoor area. 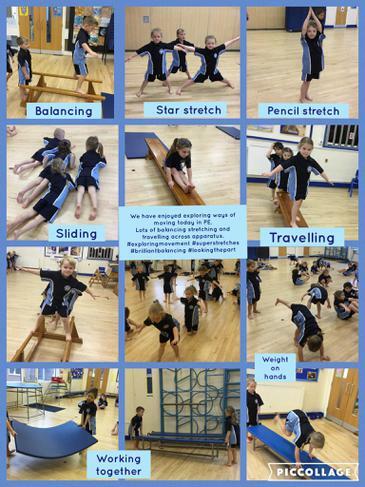 It has been wonderful to observe the children working in the Learning Lodge and extending their learning independently. 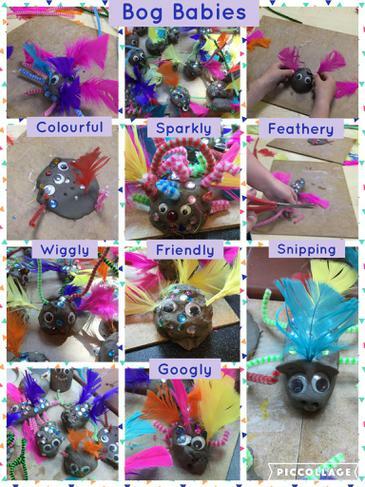 The children enjoyed working with clay to make their own diva lamps. 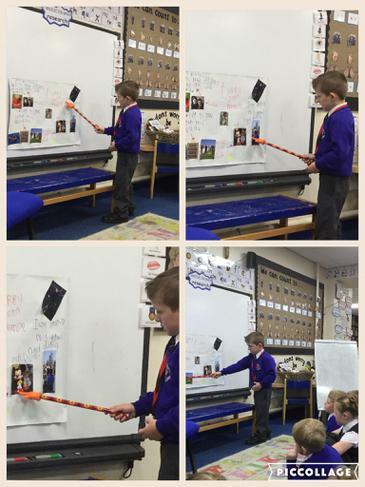 They listened carefully to the instructions and showed good control as they worked with the malleable material. Once they had dried they decorated them with paint and glitter, carefully combining different colours. We were very lucky to have a special visitor, Monica, who talked to us about Diwali and had prepared food for us to taste. The children were very keen to sample the dishes. A few children were spotted making several visits to the buffet table! Some children thought of fantastic adjectives to describe the taste. We have a wonderful class this year! 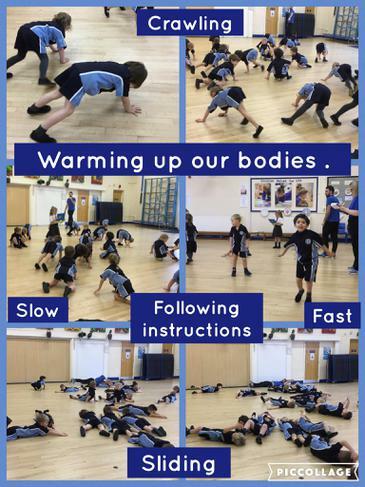 The children have now settled into the Reception class routine and are working hard. It has been lovely observing their friendships develop, as they explore the classroom and independently access the resources. 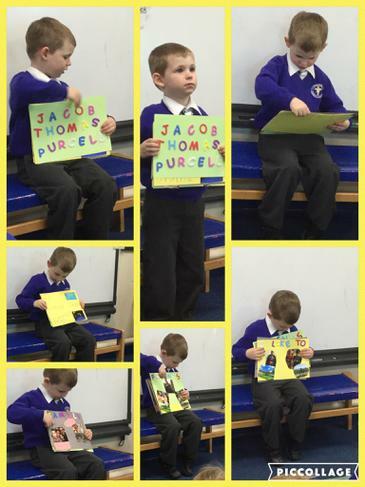 There are lots of opportunities to read in different areas of our setting. 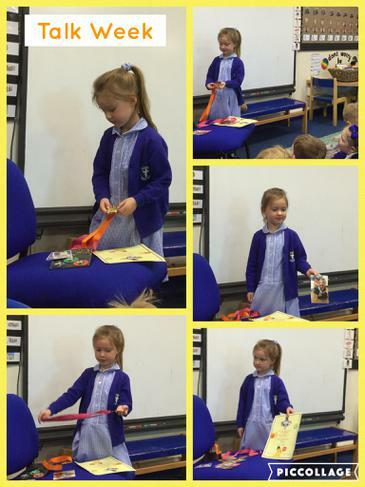 We have lots of exciting books that we hope to share with the children this year. 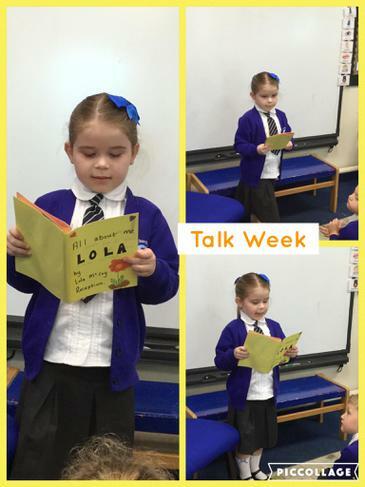 We enjoyed celebrating Roald Dahl Day and learning about the famous author. 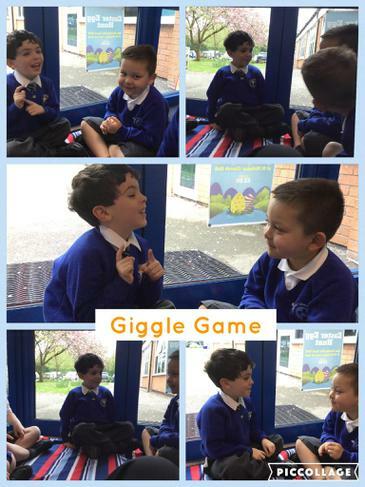 We shared the story of 'The Enormous Crocodile' and all agreed it was funny and exciting. 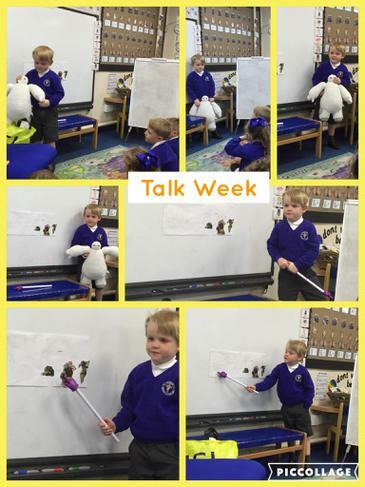 It was wonderful to observe some of the children retelling the story during COOL Time. We have been doing some marvellous maths! We have been learning about patterns. We have been very impressed with some of the creative patterns that the children have made using a variety of materials and resources. 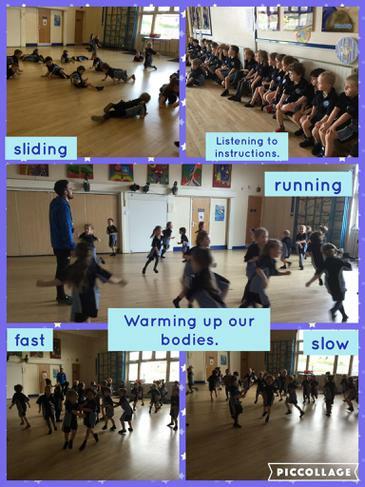 All of the Reception children looked super smart in their new P.E. kits. We have been learning about the changing seasons and have shared some fantastic fiction and non-fiction books about autumn. The children have shown great interest in this topic and many have brought in some interesting things to add to our autumn investigation tray. We will be continuing our learning by exploring how the change in the weather affects animals and birds.